Praised by experts for its clarity and topical breadth, this visually appealing, one-stop source on PCs uses an easy-to-understand, step-by-step approach to teaching the fundamentals of 80x86 assembly language programming and PC architecture. Offering users a fun, hands-on learning experience, it uses the Debug utility to show what action the instruction performs, then provides a sample program to show its application. 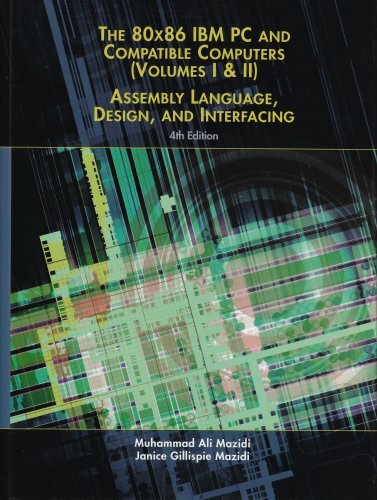 Reinforcing concepts with numerous examples and review questions, its oversized pages delve into dozens of related subjects, including DOS memory map, BIOS, microprocessor architecture, supporting chips, buses, interfacing techniques, system programming, memory hierarchy, DOS memory management, tables of instruction timings, hard disk characteristics, and more. For learners ready to master PC system programming.